Luke Air Force Base campus director David Handrahan and academic advisor Pam Unternaehrer place flags in the National Cemetery of Arizona as part of a Memorial Day salute. 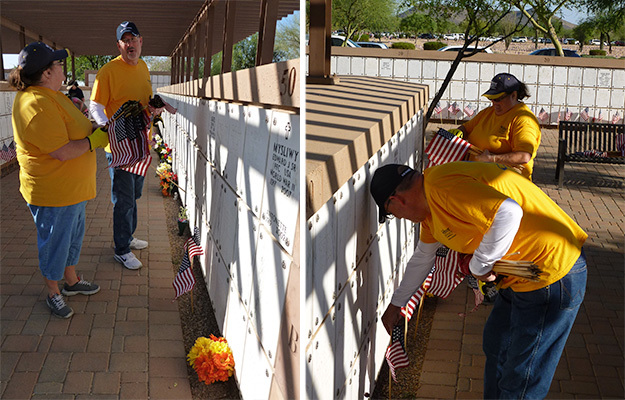 The placing of flags on each of the over 50,000 final resting places of military veterans at the National Memorial Cemetery of Arizona is an annual event that has grown in participation every year. This year, staff at Webster University's Luke Air Force Base location joined this effort that draws from military and private organizations as well as families and individuals from across the entire state. Led by campus director David Handrahan, the Webster team assembled early in Saturday morning along hundreds of volunteers. After getting instructions and gathering bundles of flags, they spread out across the high desert terrain where the cemetery has been located since 1969. Everyone worked in concert to ensure that no veteran’s burial marker was without left without a flag. Extra efforts were taken for people who had relatives or friends interred at the cemetery to make sure they could be the ones who placed the flag on the final resting spot of their loved ones. When this huge annual effort was completed, the Webster team took a moment to reflect on the sacrifices made by those they had just honored as they looked out over the thousands of small U.S. flags fluttering in the breeze across the desert mesa. Flags mark each final resting place of U.S. military veterans in the National Memorial Cemetery of Arizona. The Webster team joined in a volunteer effort to place over 50,000 flags for Memorial Day.